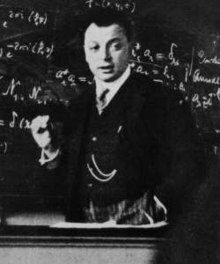 ^ Pauli, W. Naturwissenschaftliche und erkenntnistheoretische Aspekte der Ideen vom Unbewussten. Dialectica. 1954, 8 (4): 283–301. doi:10.1111/j.1746-8361.1954.tb01265.x. ^ Atmanspacher, H.; Primas, H. Pauli's ideas on mind and matter in the context of contemporary science (PDF). Journal of Consciousness Studies. 2006, 13 (3): 5–50 [2009-02-12]. （原始内容 (PDF)存档于2009-03-19）. ^ Peierls, R. Wolfgang Ernst Pauli, 1900–1958. Biographical Memoirs of Fellows of the Royal Society. 1960, 5: 186. doi:10.1098/rsbm.1960.0014. ^ The Historical Development of Quantum Theory, By Jagdish Mehra, Helmut Rechenberg, page 488, Springer (December 28, 2000), ISBN 978-0-387-95175-1, citing Oskar Klein.